Diversification provides a well-known way of getting something close to a free lunch: by spreading money across different kinds of investments, investors can earn the same return with lower risk (or a much higher return for the same amount of risk). This strategy, introduced nearly fifty years ago, led to such strategies as index funds. What if we were all missing out on another free lunch that's right under our noses? In Lifecycle Investing, Barry Nalebuff and Ian Ayres--two of the most innovative thinkers in business, law, and economics--have developed tools that will allow nearly any investor to diversify their portfolios over time. By using leveraging when young--a controversial idea that sparked hate mail when the authors first floated it in the pages of Forbes--investors of all stripes, from those just starting to plan to those getting ready to retire, can substantially reduce overall risk while improving their returns. 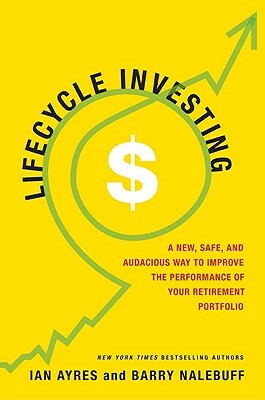 Clearly written and backed by rigorous research, Lifecycle Investing presents a simple but radical idea that will shake up how we think about retirement investing even as it provides a healthier nest egg in a nicely feathered nest. Ian Ayres is an economist, a lawyer, and the William K. Townsend Professor at Yale Law School. He has written for the New York Times, Wall Street Journal, Financial Times, Slate, and The New Republic, and his research has been featured on PrimeTime Live, Oprah, and Good Morning America. He is the author of ten books, including the bestseller Super Crunchers. A graduate of Yale and MIT, he was recently elected to the American Academy of Arts and Sciences. He lives in New Haven, Connecticut. Barry Nalebuff is the Milton Steinbach Professor of Economics and Management at Yale School of Management. He is the author of fifty scholarly articles and multiple books--including Co-opetition and The Art of Strategy--and is the cofounder of Honest Tea. A graduate of MIT and a Rhodes Scholar, he earned his doctorate at Oxford University. He lives in New Haven, Connecticut.
" A most provocative book. The real advantages of time diversification have never been laid out so clearly or with such a program of action." "Here are the chief investment lessons of the financial crisis for today’s young people: they should be buying more shares and running up debts to do so. . . . [T]here is nothing intrinsically risky about regular borrowing to get that fund off to an early start. . . . Not only does the concept make sense, it has paid off in the past. . . . Ayres and Nalebuff have looked at historical stock market data. . . . For every single cohort, the early leverage strategy beat the conventional wisdom." Moshe A. Milevsky, Ph.D., Finance Professor, York University, and author ofAre You a Stock or a Bond?